Modern landscapes don’t necessarily need brand new plant varieties. Many classic plants work beautifully in a contemporary setting. The difference is in the approach to planting. We can happily say goodbye to the meticulously pruned rectangular foundation hedge traditionally planted straight across the front of the house in favor of a looser more relaxed planting style. Clean modern lines provide a satisfying contrast to the organic forms of plants. Maki yew (Podocarpus macrophyllus var. maki) is a excellent tall accent planted in front of a long wall or in an empty corner to add softness. This 10-foot evergreen can be sheared into a particular shape if desired, but its natural pyramidal habit and slightly asymmetrical branching lends a lush simplicity to a stylish home. 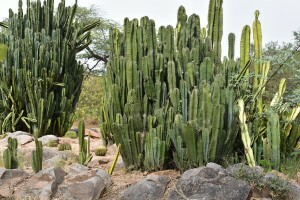 Allowing plants to grow into their natural shapes is the first step to an updated landscape. To grant your plants the permission to grow to their intended size, it’s helpful to create wider beds that have the depth to place shrubs and small trees farther away from a structure, therefore providing them the space they need to grow. Another landscape technique around newer homes is using large groups of plants massed together in geometric beds. The spiky leaves of banana yucca, Yucca baccata, work well in big clusters and their diagonal pointed shapes are nicely set off by surrounding hard surfaces. The reflected heat of hardscapes is not a problem for this tough desert perennial. For shady areas, low growing dwarf mondo grass (Ophiopogon japonicus var. nana), often seen planted in a perpendicular grid pattern near modern homes, also looks current when allowed to spread in a naturally at the feet of trees. Though it’s a fairly recently introduced variety, ‘Mojo’ Pittosporum (Pittosporum tobira) is a more traditional looking specimen.This more compact cultivar of Pittosporum fits nicely into smaller urban landscapes, garden homes and townhouses, and its low mounding shape won’t block large windows. The trick with using shrubs like this in an updated way is to avoid putting them in a row against the house or symmetrically on either side of your entry as we often see in traditional suburban landscapes. Instead, try utilizing the bright variegation as a low accent alongside a taller element or experiment with using it as contrast in a bold color container. These are just a few ideas for using almost any plant around the architecture of a modern home. Simple methods like this can also help update an old fashioned yard or bring a more relaxed and informal appeal to a conservative house. 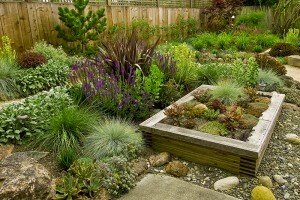 Try these drought tolerant plants as lawn replacements.